The natural environment can benefit our health and quality of life, while environmental pollution has significant costs. Unfortunately, such links between environment, health and wellbeing are often ignored within science and policy. A new report highlights the importance of taking a broader, more systemic view. Climate change is not just an environmental issue – it is also a health issue. 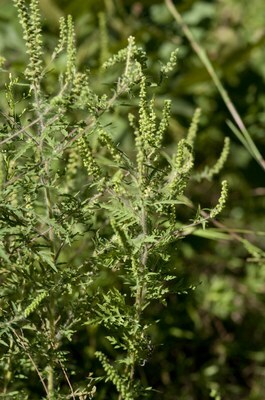 For example, consider the spread of Common Ragweed (Ambrosia artemisiifolia), a flowering plant native to North America. The seeds probably crossed the Atlantic from the 19th Century onwards as agricultural products including birdseed. It has spread more vigorously in recent years as climate change has allowed the plant to extend its range northwards. While ragweed has an environmental cost – it can significantly reduce crop yields and harms ecosystems by outcompeting native plant species – the invasive plant is best known for its health effects. The pollen is one of the most aggressive in causing allergic reactions among those sensitive, including the one in five Europeans who suffer from allergies, one in seven with allergic rhinitis or one in eleven with asthma. During periods of high pollen counts, there are few places to hide, as the pollen can travel hundreds of kilometres. In addition to the spread of ragweed, evidence suggests that climate change is making the pollen more potent and extending the pollen season. So forward looking health authorities could benefit from looking at climate change projections in order to anticipate and adapt to future health risks. This story illustrates the importance of considering the environment, health and wellbeing together rather than separately because these issues interact in complex ways with a range of costs and benefits for society. The example comes from a recent report on the 'environment, health and wellbeing (EHWB) nexus' published by European Environment Agency's (EEA) Scientific Committee. The document follows a seminar held at the EEA on February 12 this year, which brought together experts and policy makers from many different fields. Many of the participants argued for a new type of inter-disciplinary science which takes a systemic view, looking at the many positive and negative links and trade-offs between these usually separate areas. It may seem there is nothing new about considering different policy areas together – air pollution, for instance, has often been considered in terms of its health implications. But the report argues that research should further incorporate these areas, allowing us to gain a system-wide understanding of multiple causes and effects. Such a change in thinking is more necessary than ever, according to many of the participants in the February workshop. In the past, environmental issues have often been treated as isolated problems with a clear cause and effect. If a lake was polluted, for example, conventional wisdom dictated that the problem was caused by a single point source of pollution. Nowadays, we are increasingly looking at things differently. Risks interact in complex ways, with multiple causes and effects. We may come to realise that the pollution problem in the lake was the result of complex chemical reactions in the atmosphere between different pollutants and substances. Of course, part of the reason things seem more complex is that we have a better understanding of the world's complex systems. But it is also true that the world is more complex and interconnected. Globalisation has accelerated global environmental problems - climate change is a striking example of an issue which is truly global in its causes and effects. Other examples include the global movement of pollutants and the way economic trends can deplete resources on the other side of the planet. Such complexity means it may be impossible to determine a single cause for an environmental or health problem. In the case of illness caused by ragweed, there may be other factors at play alongside pollen – some studies have shown that allergies are worsened by air pollution. Indeed, this is just one of a cocktail of many hundreds of chemicals, substances in air and water, pathogens radiation and other stresses in everyday life. Add differing levels of vulnerability to this mix, and we may start to understand the complexity. Health science can also benefit from taking a broader EHWB view. Consider the increasing incidence of some types of cancers – by taking an EHWB view, health systems could focus on the multiple aspects of our lifestyles which can increase the risk of cancer, rather than just treatment. Such a preventative approach could mean reducing exposure to chemicals and pollution for multiple benefits. Another preventative health policy could be to create nature reserves. While the benefits for biodiversity are well known, there is growing recognition that enjoyment of the natural world can improve both physical and psychological health. Access to green space in cities has been linked to longer and healthier lives in elderly people, and improvements in early years development. These benefits could even spur a positive cycle – other research suggests that those in good health have a greater possibility of looking after the environment. Environmental policy is increasingly looking at these links. The European Union recently adopted its 7th Environmental Action Programme, setting out priorities for the next few years. Titled 'Living well, within the limits of the planet', the document has an explicit focus on improving the environment in order to reap benefits for health and wellbeing. Breaking out of separate silos of 'environment', 'health' or 'wellbeing' can help forward-looking policy and science. By 2050, 80 % of the EU population is expected to live in urban areas, and 30 % will be over the age of 65. This raises several questions - will air pollution be a more serious issue for a large elderly urban population? And will the effects of pollution be exacerbated by the increased temperatures expected from climate change? Trying to predict such systems-wide changes can be extremely complex – but it seems increasingly likely to be the most rational way of preparing for the future. For references, please go to https://www.eea.europa.eu/articles/environment-health-and-wellbeing-a or scan the QR code.